This month we went for the first time for a day trip to the largest marine reserve of Europe at the island of “La Graciosa”! Early out of bed, we choose a bit of a choppy day. But… everything was super organised! Great team at the Dive-Centre at “La Graciosa”. We made some cool dives in the marine reserve. You can see the fish are bigger and some species you see more often than at Lanzarote. For example we saw 3 Conger Eel’s! There a lot of big Hogfish, big lobsters around and so much more different life. Beautiful landscape of lava shaped boulders. Some dive-spots have big amounts of Sea-Fan coral. 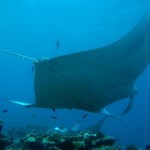 With luck they even find Manta Ray, Hammerhead and Thresher sharks at the Marine Reserve. We are happy that we can offer different experience of diving at Lanzarote with in the South dive-sites around “Playa Blanca” including “Museo Atlántico” in the North dive-sites around “Charco de Palo” and now as well amazing diving at “La Graciosa”! Also congratulations Inge with the Advanced course certification! She made the boat dive as her last dive for her course. From now we organise the Graciosa trip for clients that book a dive-package and want to see something different then the local area of the dive-centre. The trip is a Full Day trip, first by mini-bus then a transfer from “Orsola” to “La Graciosa” where in the harbour the local dive-centre takes us out by boat to the dive-sites. The trip includes 2 dives in the largest marine reserve of Europe. When will you dive with us in the Great Atlantic Ocean?